Mimosaceae Synonyms: Inga sapindoides Inga laurino Inga edulis. 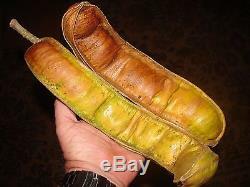 Inga feuilleei is a legume tree native to Central and South America. 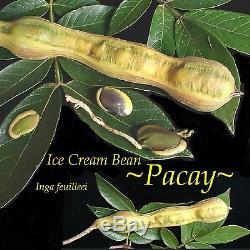 Commonly known as Pacay or Ice-Cream Bean, contains pods of fruit often cultivated for its edible white pulp surrounding large seeds. Tropical fruits of Guatemala, Mexico, Belize, Honduras, and El Salvador used by the Maya for thousands of years. Fruits and nuts have always been part of Mayan diet, however, this tree 15 meters is described as a species new to science. Most Mayan house gardens have fruit and nut trees surrounding the homes. Most frequently used as coffee shade in El Salvador and western Guatemala. Many Mayan milpas the fruit and nut trees are not cut down when the rest of the forest is slashed and burned. 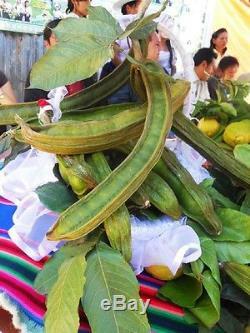 So fruits, nuts, and the soft flesh of seed pods such as Inga species have been a part of Mayan diet for a millennium. 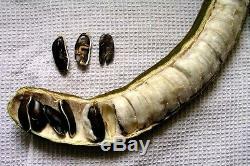 Pacay fruit, notice the seed inside the fruit, the whitish and soft goo is the tasty edible part of the fruit. Inga fruits are offered in local markets. You eat the white fleshy part covering the green and red seed. It is sweet and tasted a little like Christmas. 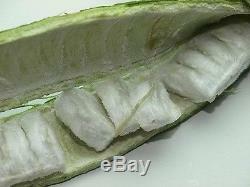 This is the seed of the edible Ice Cream Bean, after you have eaten the white fuzzy part surrounding the seeds. The black outer coating is called the testa. In Guatemala the locals cook the seed thing too and throw them in beans or eggs. This vigorous, ebullient legume forms a dense, wide-spreading umbrella crown with handsome, bright green, glossy, coarsely pinnate foliage that is distinguished by its prominently winged rachis, or leaf stalk. 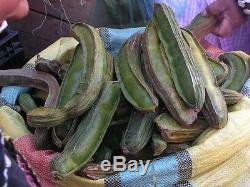 Huge, heavy, swollen, multi-ridged, bean-like pods protect a cache of slightly sweet, white, creamy, high-protein pulp, the taste of which is likened to vanilla ice cream and which is considered a delicacy by some, particularly children. 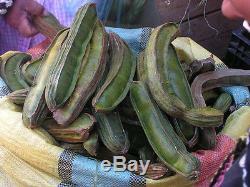 Semillas de Pacay are these long green pods. Wait until you to see the tree they come from. These are a delicious local fruit called Semillas de Pacay. The pods hold a row of seeds which are coated by a fluffy, light and sweet substance that resembles a marshmallow pocket. On little marshmallow pocket per seed. The little marshmallow pockets are wonderful, light, sweet and probably very healthy. I recommend them on their own, and I plan to try working them in to fruit salads and maybe smoothies as well. To me they tasted like fluffy honeysuckle. My daughter said they are like light bananas. The green beans are hard as a rock-like solid legumes. The green inner part you fry up with salt and lemon and is like a huge lima bean. They must be boiled until they are soft, and can then be consumed with salt and lime. The taste, absent the salt and lime, is very mild and bean-like as you would expect. They were pleasant, and delicious with the salt and lime. 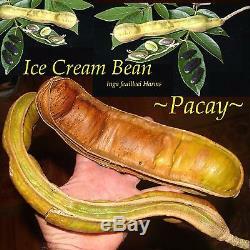 Ice Cream Bean, one of many awesome new natural food wonders in Central America. Pacay, aka many other names in neighboring countries, only grows in the lower elevation areas of Central America. All good things take time, so I grow my plants and rare palms in. Much more to check out or just get a little education on in my store. All items are delivered to USDA Inspection Station at Honolulu International airport. Please spend no more more than you can lose! The additional charge for any Phytosanitary Certificate is not included in this offer. This can only be done at the Dept. I can't really change any of these. If you want one of this and one of that, it is hard to discount much as each different species requires it's own prep, packing, then at USDA each has to be unwrapped and inspected then repacked. USDA requires me to clean and prepare every last piece before we drive them to the Inspection Station on the other side of the island. The whole next day we drive around the island and get inspected (2-3 hours), then drive to the Airport Post Office to drop off. It takes the same work with the same type item if you can understand. After you Receive your Items. There is the risk when you grow plants that they may die. LIVE PLANTS are PERISHABLE, guaranteed not to live forever. US orders ONLY are GUARANTEED for LIVE ARRIVAL. When you order a plant we assume you are prepared to care for it. It is your responsibility to know how to care for the plant. Do some research before they arrive or seek experienced help. Small plants need protection from many things, wind, sun, dry-out. They do well just in the garage or living room. They need good light but not sunlight (full sun will burn small plants). Just sitting in a shallow tray of water works well. The idea is to keep the plants from dehydrating. Be careful if you decide to re-pot. Plants are easily damaged with new/different mix. Use NO fertilizers (this may kill your plants). Proper care is critical upon arrival. Live Plants are NOT GUARANTEED to survive under your care. DO NOT expect any live plant to be GUARANTEED to remain alive. Plants are NOT GUARANTEED TO SURVIVE after you begin Care! Live arrival is guaranteed, eternal survival is up to you. IF YOU are NOT able to provide PROPER CARE, PLEASE DO NOT EXPECT plant to be GUARANTEED after it perishes. NO REPLACEMENT WILL BE CONSIDERED IF YOU HAVE REPOTTED THE PLANT. All photos must be as arrived in original condition as received (in the box and packed as delivered). If repotted, you are responsible for the condition of the plant. My responsibility ends when a live plant is delivered to your door. If you need to return an item, be sure to follow these item condition guidelines. All claims need to be supported with Photos of the damaged plant(s) as packed/unpacked, the box if damaged, the packing materials and any documents. You must return an item in the same condition as it was received, not used or altered in any way. To send any replacements, I try to piggy back with your next order. I value your business and will work diligently to keep you satisfied. If you are dissatisfied with the item for any reason, please contact me before leaving a negative or neutral comment. I want you to be satisfied! Mahalo iâ `oe no ke kipa `ana mai. When you receive your seeds, you have only 7 days to make any claim. All seed sales are final. There are no germination guarantees. Seed is a live product which depends on many important related grower skills such as proper planting time, seed depth, type of soil, irrigation, proper use of fertilizers, weed controls, fungicides, insecticides, disease free soil, and reasonable weather conditions during the growing period. Germination is affected by such factors as temperature, moisture content, light intensity and contamination of planting media. M a h a l o & A l o h a! 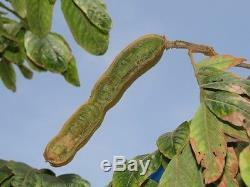 The item "ICE CREAM BEAN Inga feuilleei PACAY FRUIT TREE Large Potted Plant" is in sale since Friday, August 5, 2016. This item is in the category "Home & Garden\Yard, Garden & Outdoor Living\Plants, Seeds & Bulbs\Plants & Seedlings\Fruits". The seller is "7_heads" and is located in Haleiwa, Hawaii.